Do you want your home to be as comfortable in the summer as it is in the winter? Then you’ve come to the right place. Our expert team designs and installs several different cooling systems. But how do you know which is the best option for your home? Let us help! There are many different ways to cool your home during the warm New England months. If you already have existing ductwork throughout your home, central air may be the way to go. Central air conditioning works through a system of supply and return ducts which are typically installed when constructing a new home or addition. Don’t have ductwork? Ductless air conditioning units could be your answer. These systems can be installed to create custom temperature-controlled areas in your home and are relatively easy to install. The system includes one outdoor condenser and an indoor unit that can be hung on a wall anywhere from the baseboard to the ceiling and is controlled with a remote. Another ductless option is a mini split system that provides both heating and cooling for your home. More commonly known as a “heat pump,” this system works on electricity and has separate components that work in tandem to either warm up or cool down your home. Much like how a refrigerator keeps your food cool, the split system pushes out warm air while bringing cool air in from the outside and runs it through refrigerant coils, making the air even cooler before being pushed throughout your home. This system provides heat by reversing the refrigerant and blowing out the cool air and pulling in the warm air. Lastly, hybrid systems also offer complete comfort for both heating and cooling needs. A hybrid system brings together two heating distribution sources usually consisting of a hot water boiler and an air handler for central and zoned cooling. Whether a room, a section of your house or your entire home, what and how much you’re trying to cool will dictate which system best suites your needs. When choosing an installer, make sure they are performing a heat load calculation on your home or business. This is the only way you can be assured that the system being proposed is properly sized. Also, make sure the installer is insured for workers’ compensation and liability. It is perfectly acceptable to request verification of these coverages. 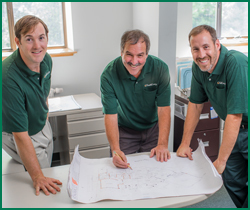 Ready to make your decision or want more information from our Scott Energy cooling experts? Give us a call at 800-736-4929 or contact Tom at tom@scottenergyco.com, and we’ll help you decide which system is right for you! Yes, please send me the Scott Energy newsletter.